This one-of-a-kind Crusader mini cathedral was manufactured by Belmont Radio Corporation of Chicago, Ill. This adorable little four-tube TRF was part of the explosion of low budget radios manufactured in the early 1930s in response to the Great Depression. 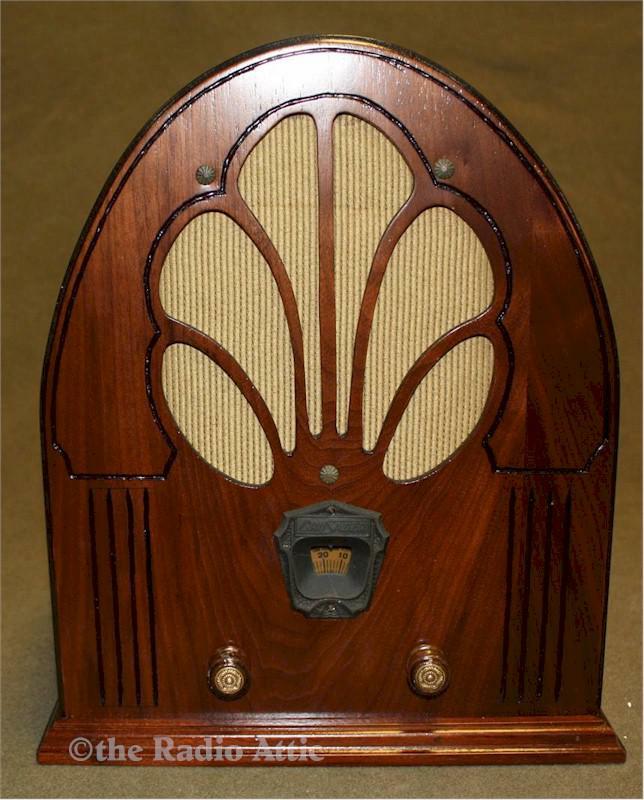 It is roughly half the size of most cathedral style radios of its day. The cabinet has been fully restored in luxurious walnut. The chassis has been totally recapped and resistors as needed. If there is a radio version of frog hair, this is it! I found no information about this radio anywhere. If you see the one on Radio Museum, this is that radio. I brought this little cutie back from total demolition and I am very proud of it (email me for before and after photos, you will be amazed.) The speaker is what came with it and is not original, but sounds very good. There are a couple of very fine pencil marks on the front that I didn't get removed well enough before going crazy with the spray gun. They are not objectionable and most people don't notice them (really ticked about that little boo-boo). You are visitor number 702 to this page.